Holistic service from one source | YOW! Are you new to the world of advertising technology and need to learn how the various devices and tools are used at all and how they can be used profitably? Do you still find it difficult to operate your new machines? Then one of our workshops could be the right thing for you! The exciting trainings (including catering) make you step by step the professional in advertising technology and textile finishing. Whether it is practical beginner training, business management training or a graphic training course, let us invite you to the world of advertising technology and show us what is possible here. Then you too will quickly become an expert in the subject. The exciting offers can also be worthwhile for advanced users - we will answer any questions you may have. Our service for you also includes the issuing of vouchers worth 25 to 1000 euros as well as the creation of high-quality textiles. 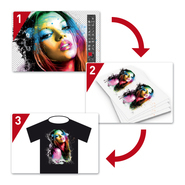 The textile transfers in the size A3 are full-color, whereby almost all effects are possible. Their only task is to press the textile transfer onto the appropriate textile. Take advantage of our services and expect high quality as well as great value for money. We will not disappoint you! To the service of YOW! Include textiles, trainings, workshops and vouchers. In addition to beginner training and a creative workshop, we also offer training in business management as well as a workshop in graphic preparation for plotting. In the YOW! Onlineshop Purchasing vouchers in different price categories. In addition to the fixed amounts of 50, 250, 500 and 1,000 Euro, you can also set the price for the voucher variably. 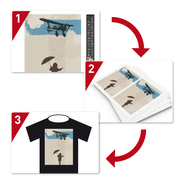 We also offer two different textile transfers. On the one hand, the READY text transfer, on the other the screen printing. If you are not really getting down to textile printing or if you are still in doubt, the YOW training courses will help. Here the professional takes you by the hand and brings you everything about advertising technology and textile printing, what you need to know. Whether the operation of the appropriate hardware, tools and aids or the creation of graphics or designs - YOW will help you.